This is an exclusive Dialog 4G seasonal offer. 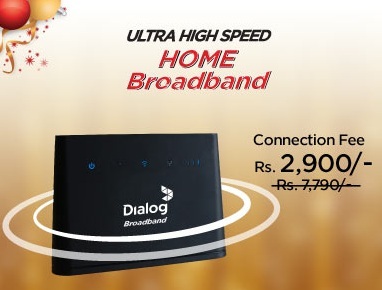 DIALOG 4G Home Broadband Normal Price Rs 7790/=. This is limited Offer valid until 31st December 2015. Dialog 4g Home Broadband monthly packages 10 GB for Rs. 900/- and 25 GB for Rs. 1,400/-. Now you can get special price Dialog 4G Router + connection Fee Rs. 2,900/-. No hidden Charges 40 GB - Rs :2900/=Monthly and 60 GB - Rs :3900/= Packages also available.